Being engaged is a wonderful feeling. We at Eventastic know there is inspiration everywhere and friends and family are making themselves available to support you at every turn. 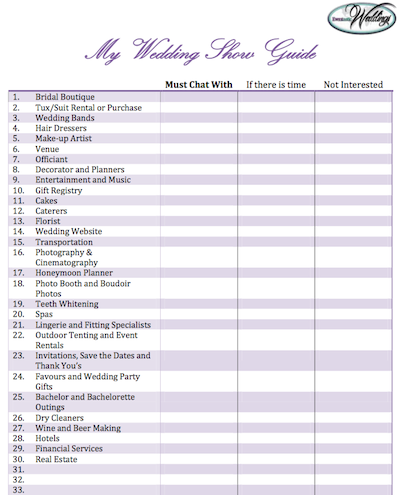 Attending a Bridal Show is often on the top of a newly engaged woman’s to-do list. These shows can be insane for a bride to be. Download our list of the possible vendor types that will be at the show. Then decide who you will need for your big day and start marking them on your ‘must chat with’ list. You may also find that you are unsure of all your needs. It is still valuable to get some information in case the need pops up, for example, if you haven’t selected your venue you won’t know if you need to bring in rentals. You probably don’t want to be wandering through the wedding show for 6 hours. There is almost always a fashion show which is a great way to veto out styles and point out to your girls what you like for dresses. Keep in mind regular meal time. Everyone will enjoy themselves much more if their stomach isn’t growling. Plan a snack or meal before or after the show. This also gives you time to discuss details and point out things you love or disliked. Don’t forget to give yourself a fair amount of time to have conversations. You may find yourself trying cakes, flipping through photo albums or looking at travel books. How far in advance do you need to be booked? What installments do I pay in? What method of payment do they accept? How many meetings do you expect to have? How long does it take to do hair/make-up? Do you have preferred vendors that you work with? Is there a discount if you book early? Don’t forget to download your Wedding Show Guide!